Between the 31st of October and the 3rd of November, the world’s best female match racers gathered in Ascona to compete in the Swiss International Women’s Match. Despite heavy rain and tricky wind conditions an impressive 66 matches were completed on Lago Maggiore. At second place in the competition we find the Swiss Team ChicaCER helmed by Laurane Metteraux. Metteraux managed to place a penalty on Courtois in the one semifinal that was sailed between the two teams. 12 teams from Denmark, Finland, France, Sweden and Switzerland competed in the inaugural Swiss International Women’s Match in Ascona, Switzerland. 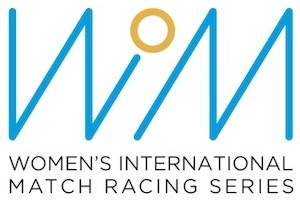 A regatta organized by Yacht Club Locarno in collaboration with Porto Patriziale Ascona and the Swiss Sailing League, is one out of five events on the women’s world tour of match racing, WIM Series. Despite challenging weather conditions with torrential rain, cool temperatures and light winds we got to witness spectacular racing on Lago Maggiore. The extremely light breeze forced the sailors to remain very sensitive and responsive in their handling of the very agile J70 boats.